This large minster (a church attached to a monastery) dominated the small Nottinghamshire town of Southwell. It was the most important church in the southern section of the Diocese of York; archbishops of York often stayed there. Most of the building was constructed between the 12th and 13th centuries. 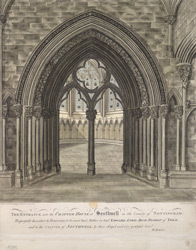 The chapter house was one of the later additions, approved in 1288 by Archbishop John de la Romaine. It has the traditional polygonal structure of English chapter houses, but its varied decorative details show the changes of style in ecclesiastical art and design over the long period of its construction.